Her aim is to be among the best in the state. “This season should be good,” said Syler, who finished fourth at state last year. “My teammates and I have prepared well and worked hard so that we have good seasons. We all want to improve our scores from last season. Syler, a four-year player for the Lady Eagles, will be supported on the links this season by teammates senior Mariah Harvey and junior Kelli Hatfield, who have played for three seasons. “Right now, we have seven players on the team,” said golf coach Regina Quintero, who is in her 18th season. “Some of the girls are new, and they are working to get in the mandatory 10 practices so our lineup will change in the early weeks of the season. Syler and Boulder City began their season Sept. 3 with a league match at Falcon Ridge in Mesquite. Syler shared medalist honors with her round of 9-over par 80, and the Lady Eagles scored 428 to place third behind winner Moapa Valley’s 421. 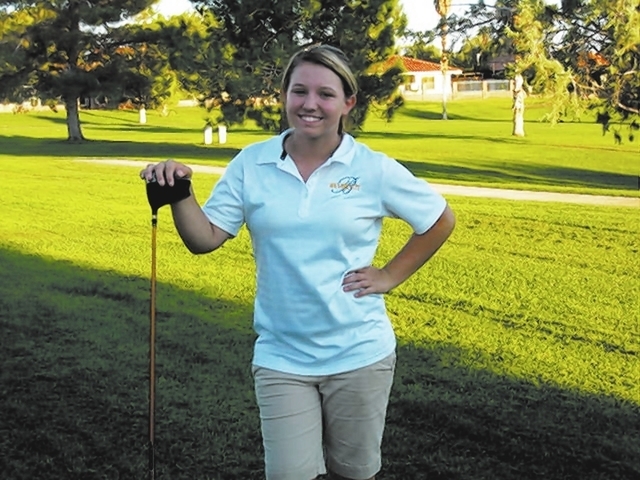 Syler finished fourth Tuesday, shooting an 8-over par 44 at Highland Falls in Summerlin. Boulder City finished with a 218, 42 strokes behind Desert Oasis in a nonleague match. The Lady Eagles play a league match today at 11 a.m. at Wildhorse, and another Tuesday at Boulder City Municipal Golf Course. Quintero has high hopes for Syler. Quintero said Syler has the potential to challenge for league and region titles, then make a run at state. But for the team to make the state tournament, the Lady Eagles need consistency from at least four golfers. Quintero would like to see a few new girls step up and give the Lady Eagles the much-needed fourth golfer to qualify the team for the Southern Region Championships. From there, the Lady Eagles will aim for a team berth in the 1-A state championship tournament. Among the newcomers to the team are freshmen Taylor Krumm, Skylar McKay and Lauryn Norris, along with junior Carlee Blumenthal. “Hopefully, Skylar, Taylor and Lauryn will get the golf bug and want to get better at the game,” Quintero said. “Hopefully, one of them will step up and be able to be the fourth individual we need. Boulder City has won two state team championships; in 2008 and 2010. Randi Lewis won the only individual title in 2010. Lewis then moved to Mesquite and won the state title again in 2011 for Virgin Valley.